Chen Sicheng’s second film as director after his successful romantic anthology Beijing Love Story in 2013, Detective Chinatown follows the unlikely duo of Tang Ren (Wang Baoqiang), a Chinese expatriate in Bangkok who calls himself a private investigator but is actually more like a swindler, and Chin Feng (Liu Haoran), his distant cousin who pays him a visit to take his mind off his latest failure to enter police college. The zany Tang and the strait-laced Chin are an unlikely fit, but soon they have to set their differences aside as the former is accused of the murder of an art smuggler. The two competing sergeants of the Bangkok Chinatown police station (Chen He and Xiao Yang) are in a race to bring him to justice, as the one who does so is sure to become the new commissioner. Chased not only by the police, but also by a local crime boss (Chin Shih-Chieh) who thinks Tang stole his gold, and a trio of thieves who actually stole that gold but also think Tang stole it from them (Xiao Shenyang, Sang Ping and Zhao Jingjun), the two cousins can only count on the help of Tang’s landlady (Tong Liya) – whom he no-so-secretly loves – as they try to clear his name by looking for the real killer. It helps that Chin has an almost Sherlock Holmes-like capacity for deduction, and an endless knowledge of detective fiction. 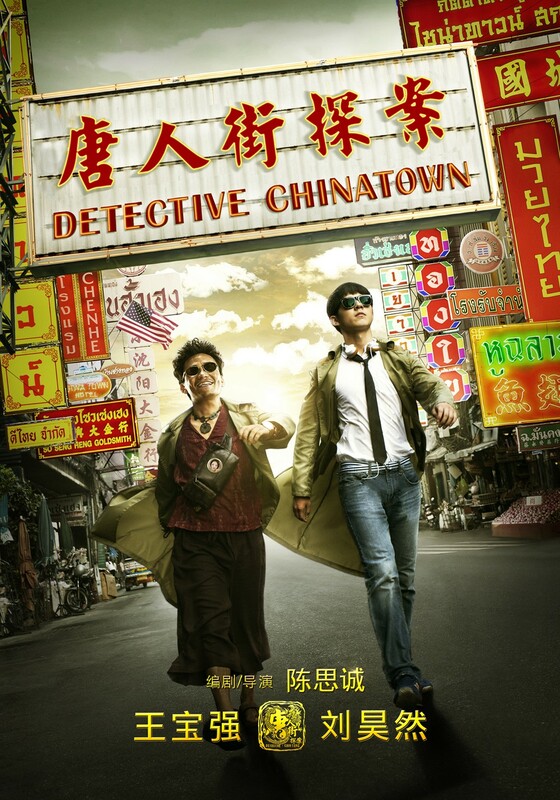 A blast from start to finish, Detective Chinatown is a fusion of the tightly-scripted Sherlock TV series (which is perhaps nowhere more popular than in China), with typically Chinese madcap humor. The result is infectiously fun and – more surprisingly – visually quite ambitious. The locked-room mystery at the center of the plot is a clever one that gets unravelled progressively, unlike so many Chinese films that stay opaque then switch to an explanation marathon. As in much of the detective fiction that is mentioned throughout the film, the mystery and resolution require some suspension of disbelief, but that’s obviously part of the pleasure: Arthur Conan Doyle’s seminal Sherlock Holmes novels and short stories aren’t about realism, they’re about calculated plausibility. The central duo of Wang Baoqiang and Liu Haoran works as a kind of Yin-Yang, Holmes-Watson team, if Holmes were uptight, fresh-faced and constantly overshadowed by a very loud and whiny Watson. Liu is indeed a bit bland, but it’s not entirely his fault: next to him Wang acts up a storm, pulling some of his most outrageous rubber faces, his voice stuck in an alternatively whiny and triumphant high pitch. It’s not a performance for all tastes, but for those well-disposed towards Wang’s brand of hyper-acting, it’s a thing of strange beauty. There’s also a vast supporting cast of comedic dynamos, including Chen He as a vain police sergeant who keeps hurting his nose (it’s funnier than it sounds), in an irresistible double-act with Xiao Yang as his greasy and cowardly rival. Respected Taiwanese thespian Chin Shih-Chieh also pops up and gratifies the audience with a karaoke performance to make Song Kang-ho in Memories of Murder sound like a multi-platinum artist, before engaging with Wang Baoqiang in the funniest pas-de-deux since Huang Bo and Shu Qi in Journey to the West: Conquering the Demons. Interestingly, popular comedian Xiao Shenyang, usually not a restrained performer, actually stands apart with a fine deadpan turn. But far from coasting on the energy of its cast, the comedy in Detective Chinatown is consistently inspired, taking familiar and broad ingredients like pratfalls, farcical sliding doors or running gags and integrating them to the plot’s forward motion, rather than making them extended interludes as often is the case in other Chinese comedies. Backed by Nathan Wang’s delightful lilting and energetic score, Chen Sicheng also orchestrates a few hilarious set pieces in the form of chaotic chase scenes that gloriously exploit the Thai setting (the world-famous Bangkok floating market in particular) and are enhanced by unexpected visual ambition. One superb lateral tracking shot (a la Old Boy) sees two enemy factions battle it out while the two protagonists crawl through the mayhem to escape. A well-deserved hit in Mainland China, the film teases a sequel set in New York’s Chinatown; a welcome prospect, all the more so as the ending introduces an intriguingly darker undercurrent.